3DCeram-Sinto is showcasing its latest innovations at Ceramitec 2018 fair, from 10th to 13th April 2018.This year, the fair will especially focus on additive manufacturing in technical ceramics. Come to visit us! 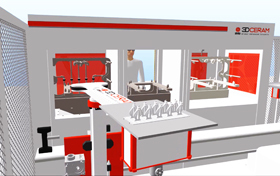 > NEW 3DCERAM 4.0 AUTOMATED 3D PRINTING LINE! Additive manufacturing process becomes industrial. 3DCeram-Sinto proposes now an innovative integrated and automated additive manufacuring line dedicated to ceramic, a first on the market! CERAMAKER printers are at the heart of the line and automating of cleaning booth and kilns help you get high output process. Come to discover the line at our booth! > PARTNERS TO BOOST INNOVATION! 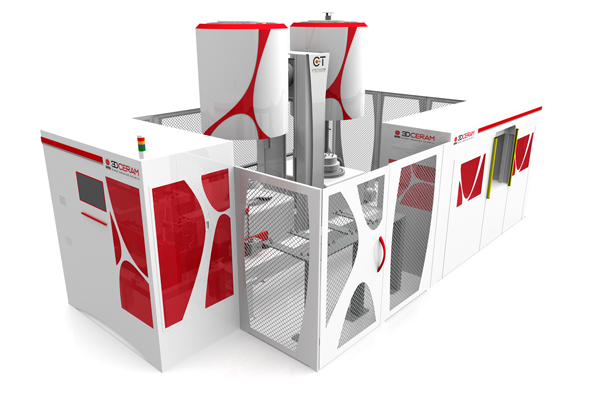 3DCeram Sinto and Dorst Technologies signed for a partnership to develop sales of solutions dedicated to ceramic 3D printing. With this agreement, 3DCeram-Sinto will expand its global sales presence and Dorst Technologies will widen its portfolio by accessing the latest innovation in additive manufacturing. 3DCeram Sinto’s innovative solutions dedicated to ceramics additive manufacturing. Dorst Technologies’ worldwide sales network and expertise in shaping of ceramics. 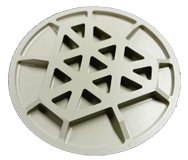 formulations dedicated to CERAMAKER 3D printer. Si3N4, SiO2, Zircone 8Y enable to explore new possibilities an achieve optimal results. The on-demand formulation service will also give you the opportunity to test you own ceramic: formulation, definition of the printing and sintering parameters . 3DCeram-Sinto brings solution to Aerospace, Medical and advanced industries. Come to visit us and don’t miss the opportunity to give new dimension to your ceramic project !